As the NFL struggles with how to deal with the national anthem protests, the league’s ratings and stadium attendance is reaching new lows. According to October Cable Coverage Estimates, ESPN lost over 15,000 subscribers every day during the month of October. But it was not the only major cable sports giant to lose subscribers—FoxSports1, also lost 584,000 subscribers in the same month. But as Breitbart News pointed out, the FoxSports1 decline can be attributed to the network making the same mistakes as ESPN. In October, FoxSports1 invited Reverend Jesse Jackson on Undisputed, the network’s main debate show. Jackson then proceeded to bash President Donald Trump and used slave references to describe how players are treated in the NFL. According to Breitbart News, the move was “straight out of the ESPN playbook,” and especially strange, since FoxSports1 has branded itself as an alternative to ESPN. 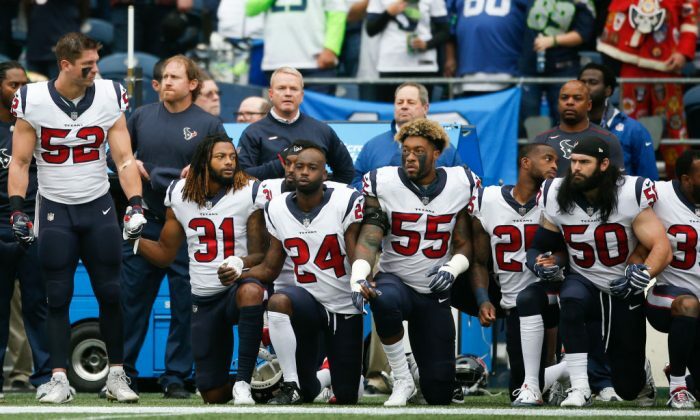 Some NFL fans have been turned off from the continuing trend of kneeling in protest during the anthem that was started in 2016 by currently unsigned Colin Kaepernick, who claimed he was protesting against “police brutality” and “racial injustice.” Critics argued that it was not the right time, nor the right venue, to inject politics into the formerly apolitical NFL. An article by award-winning journalist James Andrew Miller for the Hollywood Reporter seemed to put the cherry on top, suggesting that ESPN might part ways with the NFL entirely after their current contract ends. ESPN’s shrinking subscribers will make it difficult for the network to be able to afford Monday Night Football after 2021, the date when their contract ends, according to Breitbart News. In the latest blow for ESPN, staff at the network are bracing for another possible round of layoffs late this year, multiple sources tell Sporting News. As the New York Times points out ESPN pays the NFL $1.9 billion annually, making it the only network to pay “nearly twice” that of any of its other network rivals. According to Sporting News, unnamed sources told them that the next round of cutbacks could occur in late November or early December this year, with 40 to 60 positions potentially being impacted. The layoffs could hit both on-air TV and radio talent and also behind-the-scenes production staffers. “This time it won’t matter if you’re ‘liked’ or not. It’s not going to be pretty,” one source told Sporting News.